After using Windows 8.1 preview for few days I noticed that my Internet Explorer is not opening in metro style mode even though I am clicking on the tile placed on my start screen which was behaving normal, just before few days. If you are facing the same problem then this post will be really helpful to you.Although I mentioned about Windows 8.1 which means I have IE 11 on my PC but, this works also for IE 10 on Windows 8 PCs. First of all this is not a bug or issue, in fact this is its normal behavior. Now, you may ask why is this happening? OK, answer is quite simple but confusing. Setting a browser as default other than Internet Explorer led to this situation. Now this statement made half of the answer to question “How to bring back IE 10/11 to metro style mode ?” Let’s see detailed steps to do this. Open Internet Explorer and click on menu ‘Tools’ (if you are unable to view the menu bar, press ‘Alt’ key from your keyboard or you can use shortcut ‘Alt+T’ ) and then click ”Internet Options’. A window pops out with different tabs. Go to ‘Programs’ tab. Click on ‘Make Internet Explorer the default browser’ as shown in the figure. Step-3: You’ll be presented with ‘Set Default Programs’ window containing list of programs installed on your PC. 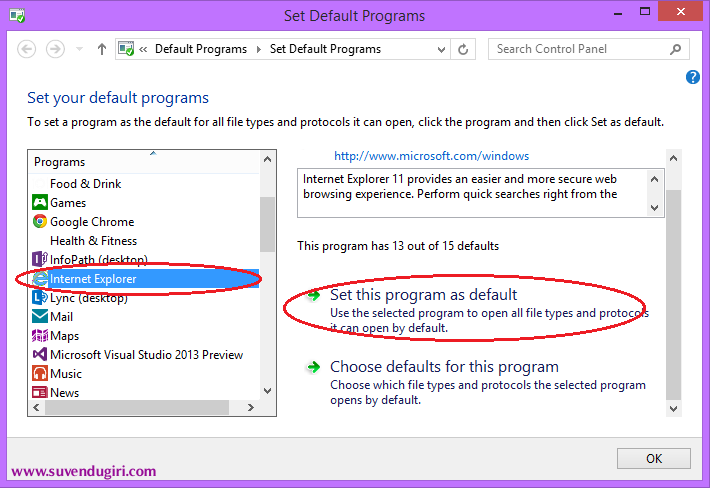 Choose ‘Internet Explorer’ from the list and click on ‘Set this program as default’. Finally click ‘OK’. Update (24 July 2013): Corrected incorrect information that was present in the post. I deeply regret for the same.